Unlike our definitions of ischemic heart disease, lymphoma, or AIDS, the DSM diagnoses are based on a consensus about clusters of clinical symptoms, not any objective laboratory measure. In the rest of medicine, this would be equivalent to creating diagnostic systems based on the nature of chest pain… Imagine deciding that EKGs were not useful because many patients with chest pain did not have EKG changes. That is what we have been doing for decades when we reject a biomarker because it does not detect a DSM category. We need to begin collecting the genetic, imaging, physiologic, and cognitive data to see how all the data—not just the symptoms—cluster and how these clusters relate to treatment response…Patients with mental disorders deserve better. 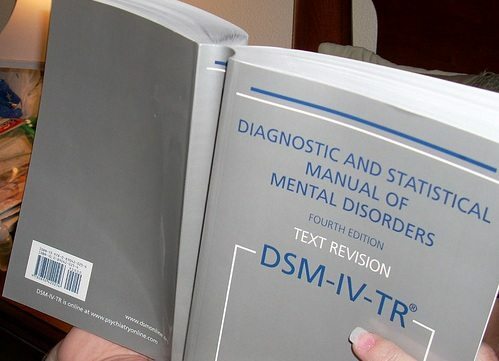 One point of discomfort about the new edition of the DSM has to do with the large increase of perceived conflicts of interest among those working on its committees. Critics of the DSM-5 point out that 70% of people serving on its committees for the definition of specific diagnoses have financial ties to pharmaceutical companies. In the previous edition, the proportion was 57%. The process of putting these manuals together is unusual(please consult Jon Ronson’s The Psychopath Test for one description) and reportedly the development of this fifth edition was wracked with conflict. Dr Allen Frances, who chaired the revision of the previous edition, has spoken out as one of these critics. “People with mild problems are overmedicated and people with severe problems are terribly under-medicated because access to care is terribly underfunded.” Dr. Frances worries that the new edition exhibits a loosening of criteria in several major disorders and could lead to further overmedication. He is quoted as saying “the work on DSM-V has displayed the most unhappy combination of soaring ambition and weak methodology” and has expressed concern about an “inexplicably closed and secretive process.”. “One of the new diagnoses that the editors chose to exclude is ‘attenuated psychosis syndrome,’ a condition designated to describe youth who are at high risk of developing schizophrenia—before they develop the full-fledged disorder.